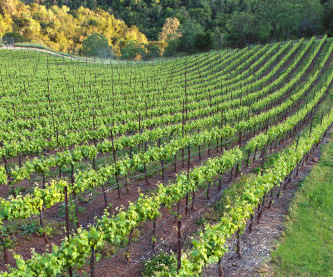 Between boulders clinging stubbornly to the steep slopes of Pritchard Hill, the Melanson Vineyard sits east of Oakville among some of the most highly regarded and closely held vineyard properties in the Napa Valley. Vines grow at elevations from 1,100 to 1,380 ft. above sea level, in fractured serpentine and clay soils laden with igneous and seabed rock. Melanson’s southwestern exposure is a distinct advantage, especially at elevations that translate to later bud break and harvest. Solar radiation is magnified at this altitude, while variations between high and low temperatures are moderated. The result is mountain fruit with thicker skins and higher tannins. The ink-black, super-concentrated berries are powerfully expressive of the site, with pronounced granite minerality. 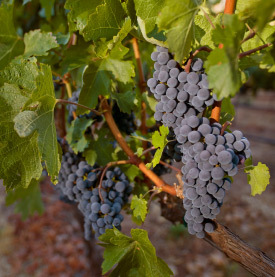 The higher tannins give the wine more structure with less weight on the palate and excellent aging potential.